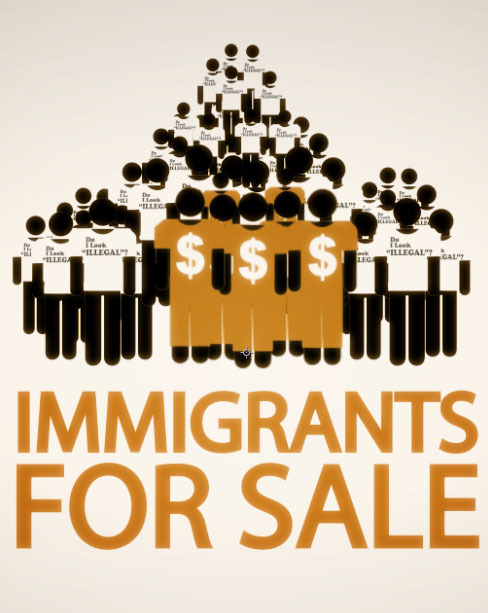 Countless lives of undocumented immigrants are being taken and sold for billions of dollars. Watch the disturbing details unfold and listen to the first-hand accounts of the real cost of private prisons. 2:12 Private prisons such as the CCA (Corrections Corporation of America) own over 200 facilities in the nation and makes a profit close to 5 billion dollars per year on inmates. They rely on anti-immigrant laws like Arizona's SB1070 and copycat laws across the nation for fresh inmates and continual profit. 5:58 Mother and son, Emily and Logan, suffer the repercussions of private prison greed as they commute to her husband's final court date in Georgia, the victim of anti-immigration laws. 8:47 "El Refugio" offers free food and overnight housing for families visiting loved ones in the detention centers. The CCA tries to prevent this service by escorting anyone handing out fliers off the premises. Family members share testimonials about how these prisons do not accommodate inmates who have health conditions such as diabetes. 11:22 Public Health Services denied urgent medical attention to detainee, Roberto Marinez-Medina, who was arrested for not having a valid drivers license. He died a month later. 14:31 American Legislative Exchange Council, or ALEC, pours millions of dollars into creating anti-immigration laws like SB1070 for their own benefit. ALEC "persuades" town officials. They claim that private prisons cut public budgets, but the reality is different. 17:12 The detention center of Littlefield, TX sucked the town dry. The city invested a large amount of money into a facility and did not get much in return. Many businesses closed down and the hospital nearly did as well. 18:40 A former detainee recalls the numerous injustices she lived through in prison. 23:58 The GEO Group, Inc is heavily invested in providing immigration detention services for the federal government. A mother of a mentally ill man who was detained because of his immigration status shares her story of frustration. He was beaten by officials and sent to the hospital while in custody. 27:53 An ex-CCA Florida Correctional Officer shares what she has witnessed and why she was terminated. CCA has made it very difficult for her to find a job. 31:30 Pembroke Pines residents talk about how CCA prisons are affecting their communities. 98% are opposed to the new detention center.